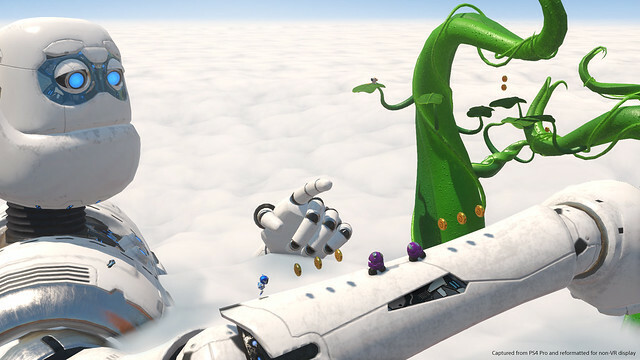 Our favorite lil' bots are back in a brand-new PS VR platforming adventure. Hello, everyone. I’m Nicolas Doucet, creative director and producer at Japan Studio. It is a great honor to share details about a new game we have been working on. On behalf of Asobi! 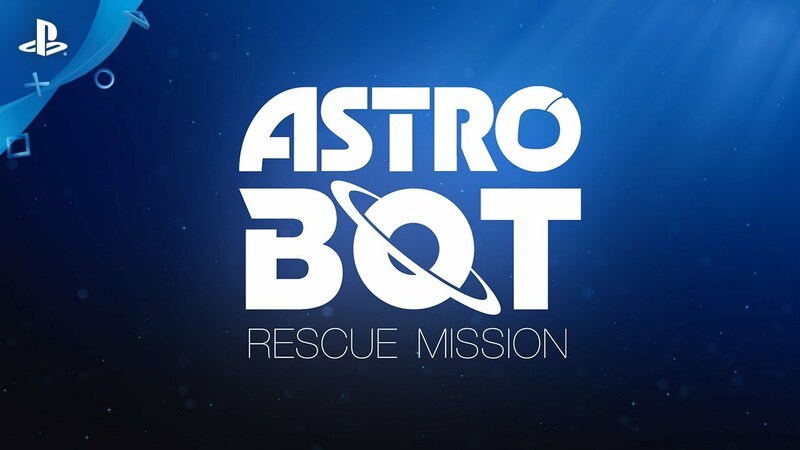 Team and Japan Studio, I am pleased to announce our brand new title for PlayStation VR: Astro Bot Rescue Mission. The game is being developed by the team who brought you The Playroom and The Playroom VR. This time we took a new direction to challenge a genre that is close to the heart of many gamers out there (including us! ): platform action games! 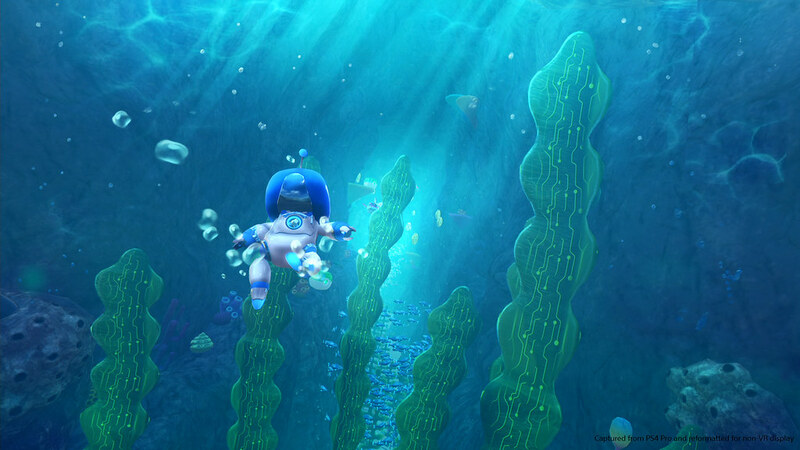 Astro Bot Rescue Mission lets you take control of Astro, the Bot captain of a ship on a mission to rescue its lost crew, who are scattered over 5 planets. You will be running, jumping and punching throughout 26 stages across 5 worlds, each ending with an epic boss fight. 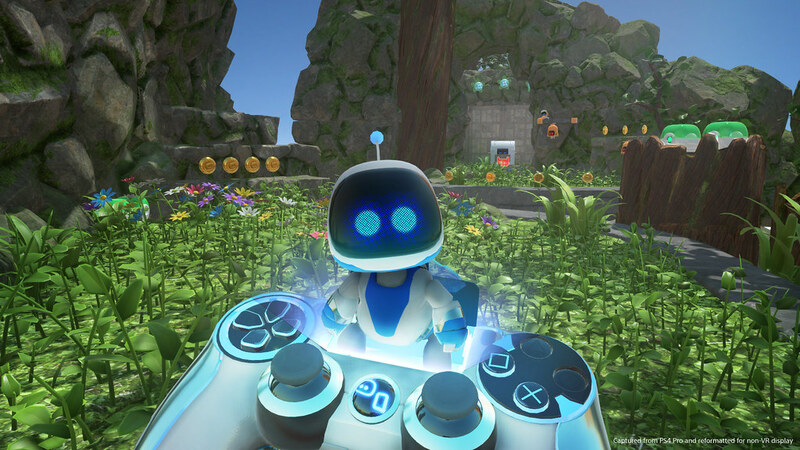 Thanks to PS VR, we were able to take platforming to new heights and develop rich gameplay around the player, taking advantage of the increased perspective, proximity and the added depth that PS VR offers. As a result, the game feels incredibly smooth, and jumps are ultra-precise – even in situations where the action ramps up. This opens up many doors for innovative play such as playing an entire sequence from multiple angles – below, from above, across 180 degrees or by leaning round corners to discover ledges and progress through levels. You, the player, also exist in the world as a big robot following Astro around. Occasionally, you will have to smash parts of the environment and dodge enemy attacks. If you are compromised, chances are that Astro would perish as well, so both of you staying alive is paramount. Another cool feature of the game is the many gadgets that emerge from your DualShock 4. 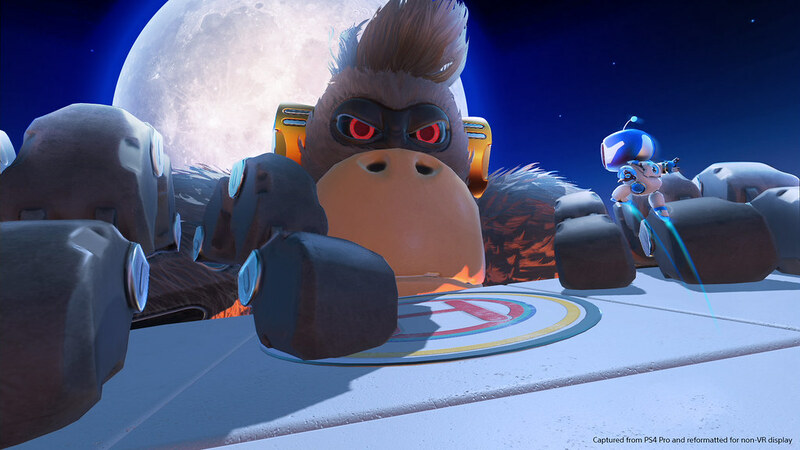 In Astro Bot Rescue Mission, your controller is visible in VR and becomes host to a range of cool weapons. Depending on the situation, it may become a hook shot, a water gun, or even a deadly ninja star – very useful for chopping spider webs, creating platforms or slicing enemies in your way. These gadgets will be found on your path so keep an eye out for them. The goal of each stage is to rescue your lost crew. Every time you find one of them hiding somewhere, a good old nudge will send it flying back inside your controller. There are 8 lost bots in every stage so if you do the math… errr it’s… a lot! Chances are you will not find them all easily but, if you listen, you will be able to hear their SOS calls, thanks to the 3D audio inside PS VR. Each level has a totally unique visual vibe so every location feels fresh. Our unique settings come together to make the most of PS VR’s 360 degree field of vision. Locations range from city rooftops to sandy beaches, dark caves, volcanoes, and even inside the belly of a gigantic whale! Every world you traverse ends with a huge boss battle, creating exciting, memorable gameplay moments. Imagine turning to find a 100-foot tall Gorilla towering to find it’s taking a bite out of the building you are standing on! The sense of the scale in PS VR really is amazing. The hardware is a perfect match for Astro Bot Rescue Mission. It definitely needs to be seen to be believed! And if you feel like chilling out after all that action, the collection room lets you spend your hard-earned coins in the crane game to build interactive dioramas and check on how much of your crew has been rescued. 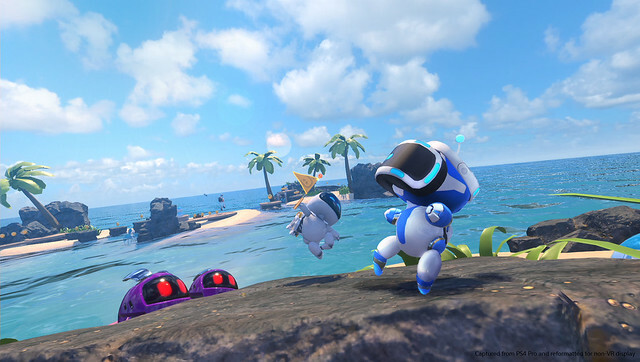 I hope you guys are as excited as we are about Astro Bot Rescue Mission coming to PS VR. We’ll be back soon with more details about the game. Until then, thank you for your continued support! Wow, this looks wonderful! I loved Playroom VR and especially the Robots Rescue mini-game. I always hoped one day a full game would be made out of it and it looks like my wish has come true. The Astro Bot demo on the Playroom has been BY FAR the best PSVR experience I’ve had. Beyond hyped they’re making a full game. Pre-ordering for sure! Robot Rescue was so fun! I’m definitely going to pick up this game. This is fantastic can’t wait!!!! This is amazing. Robot Rescue was definitely one of the early hi-lights of how awesome PSVR could be – so glad you’ve made a full game of it! That was the game that I first got used to the feeling of “motion” in VR – just floating forward as you moved the character forward in the game. Since you could take it at your own pace, it was very helpful to use that game to go slowly at first until getting comfortable with movement. A big help with tackling motion sickness in other games! I dunno if this had always been planned for a separate, more expanded release aside from “Robots Rescue” on Playroom VR, but just in case it was set in motion thanks to all of the wonderful feedback you received, I wanted to express my gratitude for listening to your fans! Robots Rescue was, (and still is to this very day) the most fun I’ve had with my PSVR. Such a simple idea, to make a 3rd person platformer, but within the confines of being able to oversee the levels in complete VR…it was unlike any other experience I’d dove into! Day one preorder from me as well! You know we’ve been waiting. Love this! Glad to hear this is happening – one my favorite VR games. I hope co-op game makes a return in some way too.. it was fun to play this on the tv while my sisters/parents friends tried out VR. Anyway thank you Japan Studio! One of THE best VR experiences gets a full game. Awesome!! Can’t wait. Replay Robot Rescue and still haven’t found everything. Wow I was so hoping they would make this into a full game! It sure was fun in playroom. Congrats! I wish you great success. LoL! Can’t wait to play this as a complete game. You guys are awesome! Thank you for listening to the great feedback! This team does some insanely amazing work in VR. Even the little nuances like the ghosts flowing through the little tubes in the ghost traps. So much sharpness and charm. Glad to see a fully realized game coming from them. Day 1. As many others have said, based solely on my time with playroom vr, this is likely a day one purchase for me. I am totally buying this. I have wanted this to be real since I first tried robot rescue! Robot Rescue in Playroom VR is one of my favorite early PlayStation VR experiences. I’m so glad it’s being turned into a fully fleshed out game! Thank you! Thank you so much for listening to all those PSVR gamers, who like me, wished to get a full scale Robot Rescue game as soon as they finished the demo ;) This looks absolutely stunning, I will be there on release day! WOW !! I’ve only had my PSVR for a few weeks now, but as others have said… the Playroom is one of the best “games” out there. After playing bot rescue on that… I wished it was a full game. And now that wish is coming true. This will be my FIRST pre-order game on my PS4. I think VR lends itself to “Arcade” style games that can be played in chunks. Is there a projected date for this?? Did we get a release date yet?